Captain Ian Fraser listening to a talking book. Blind Veterans UK Collections and Archives, OGA 4796. 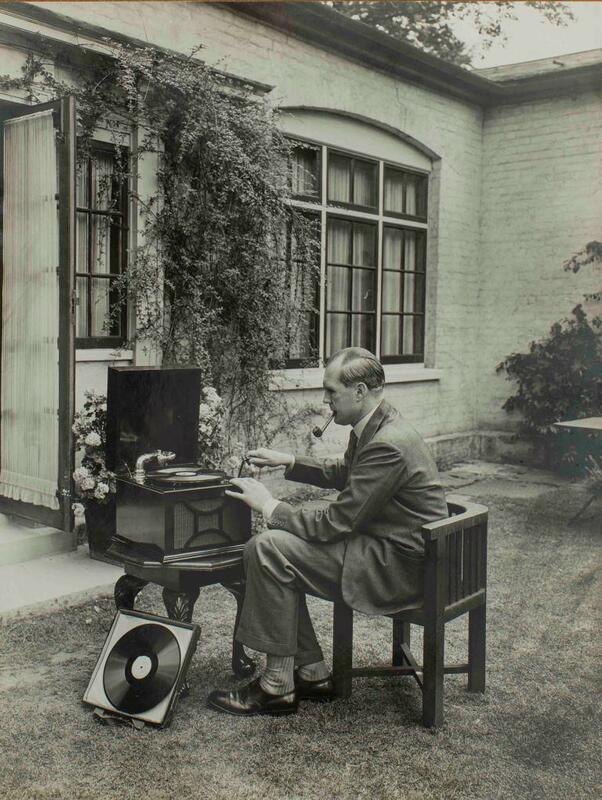 The Royal National Institute of Blind People (RNIB) and St. Dunstan’s, a charity for the rehabilitation of blinded ex-servicemen, began recording books in 1935. ‘Talking books’ were read aloud by professional actors on specially modified gramophone records. They appealed in particular to the 80% of Britain’s blind population who could not read braille. Many of these people had lost their sight as adults and never learned to read with their fingers. This was the case with soldiers who had lost their eyesight during the First World War as a result of wounds, chemicals, and diseases. Captain Ian Fraser, who had been shot through the eyes by a German sniper in 1916, conceived of spoken word recordings while listening to a gramophone at St. Dunstan’s: ‘Theoretically it should be possible to record whole books.’ Fraser went on to become Chairman of St. Dunstan’s at the age of twenty-four and to lead efforts to develop talking book technology. Talking books went out to readers on November 7, 1935. The first ones were Agatha Christie’s The Murder of Roger Ackroyd, Joseph Conrad’s Typhoon, and The Gospel According to St. John. 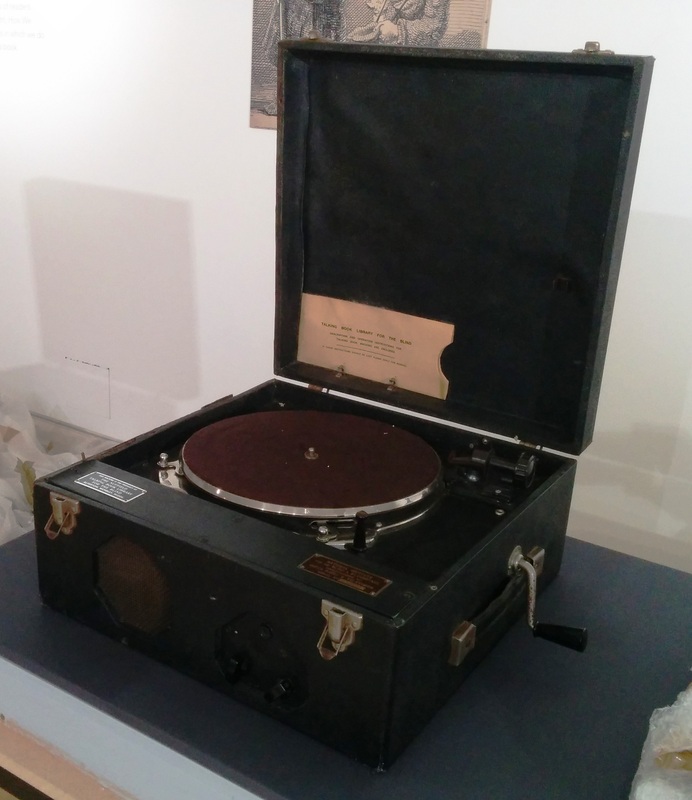 Each title consisted of a set of gramophone discs that could play for approximately twenty-five minutes per side. The average size was ten double-sided records. Books were shipped in a sturdy container at no cost to borrowers, who had only to pay return postage. Membership in the Talking Book Library was free to anyone registered as blind who purchased (or received through charity) a turntable. This is how I enjoy the Talking Book. Every night at about ten o’clock I shoot the wife off to bed, then make up the fire, draw my armchair near, and, after having got a bottle of Worthington and a cigarette going, I switch on the Talking Book. Don’t you think this is real luxury? If the book is particularly interesting, it is possible I may have another disc and another Worthington, retiring to bed about midnight, taking care to replace disc in box and empties in proper place. I have only read two books and thoroughly enjoyed each. Not being able to sleep much, and being very poor at Braille, you can imagine how useful the Talking Book is to me. Decca Battery Model Talking Book Machine, 1947. RNIB Collection. The turntable shown above has been specially designed for use with talking book records. A permanent needle ensured that blind people could operate it on their own. The turntable’s double spring motor, if wound fully using the handle on the machine’s right side, played an entire side of a talking book record. The speed was adjustable in order to make use of both American books (33 1/3 rpm) and English books (24 rpm). It was manufactured by Decca Radio & Television. Elizabeth Gaskell’s Cranford (read by Anthony McDonald), 1936. RNIB Collection. This talking book consists of eight records processed by the Decca Record Company in 1936. 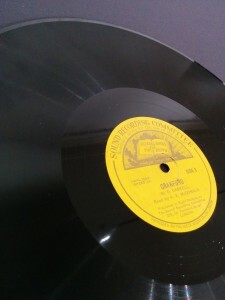 The 12-inch shellac gramophone discs could play for approximately 25 minutes per side when played at a slow speed of 24 revolutions per minute (the normal speed was 78 rpm). Records were shipped through the post in sturdy containers at reduced postal rates.